Minecraft 1.8, the first release of the Bountiful Update, added and changed many aspects of Minecraft. Among many things, the update made it easier for map makers to create adventure maps, as it added many blocks, mobs and a structure for Survival play, and many commands were added or extended. The world boundary was enforced dynamically, many Survival mechanics were changed, and Spectator mode was added. Performance was increased significantly, and many options for world customization were added. Once installed and/or extracted, run the program, click the Options button, choose the version you wish to install and click the Install button. Note1: Java version 8.0 is required. You can download and/or update your Java version here. Note2: No Mojang/Minecraft files are packed and/or distributed within zip archive, auto installer or the launcher. What a massive update! 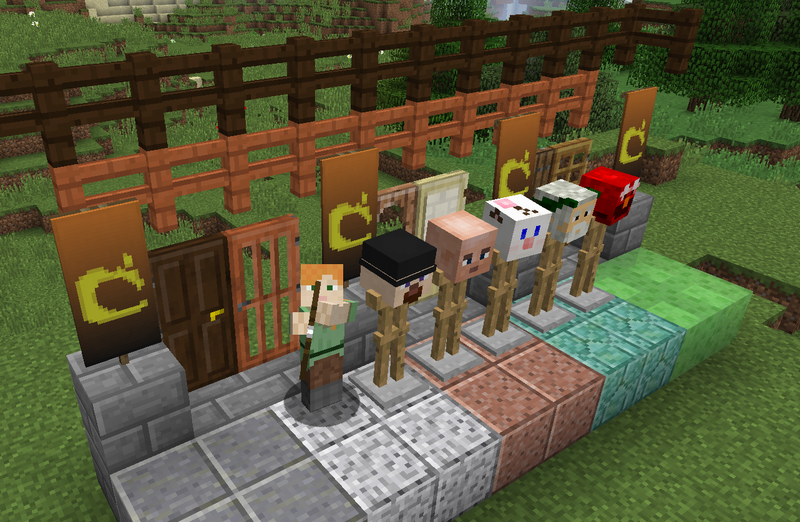 New doors, armorstands and even banners! Let us know in the comment section what ideas you have to put on those banners. Enjoy playing Minecraft? Why not support game buy purchasing a copy over on the Minecraft Website. Doing so will give you access to skins, premium servers and the official launcher!